China on Monday warned the US against the planned public appearance by President Barack Obama with the exiled Tibetan spiritual leader, saying it opposed foreign leaders meeting the Dalai Lama "in any form" to meddle in its domestic affairs. "China is opposed to any nation or government using the Tibet issue to interfere in China's domestic affairs, and opposed to any country's leader meeting with the Dalai Lama in any form," foreign ministry spokesman Hong Lei said at a Press briefing here. The two Nobel laureates are scheduled to appear at the National Prayer Breakfast in the US Capital on Thursday, where Obama is scheduled to deliver a speech. Reminding the US of its commitment on "Tibet-related issues", Lei said that the American side must deal properly with relevant issues in "keeping with the overall interests of bilateral relations". Decrying foreign interference in China's domestic affairs, state-run China Daily newspaper said in an editorial today: "Should a president of the US meet with the Dalai Lama, it will unquestionably step on China's toes and therefore cast a shadow over US-China relations. "Obama is acquiescing to the Dalai Lama's attempt to split Tibet from China," it said. Meanwhile, White House officials downplayed the strong sentiment displayed by Beijing and stressed that the two leaders have met thrice earlier, and there was no "specific meeting" between the two. 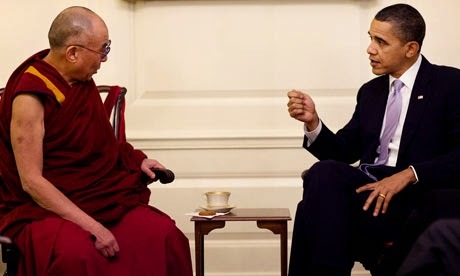 Previous meetings of Obama with the Dalai Lama have been met with fierce Chinese protests and some of the foreign leaders had dodged their meetings with the 79-year-old monk altogether.